Bye rigid frame, hello shocks! 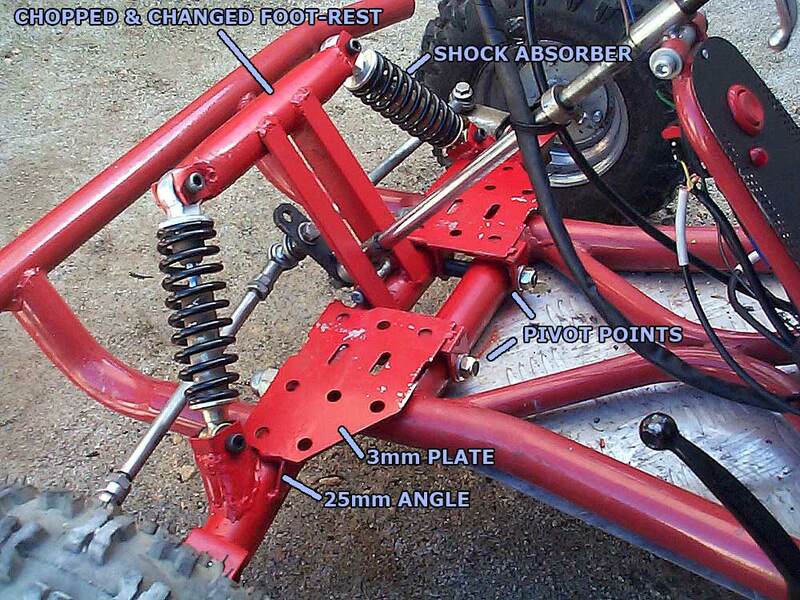 Here is a short guide to adding shock absorbers to the front-end of a Drift-2 gokart. One thing that was very clear to me after the first ten minutes riding my Drift-2 over fairly rough ground was that the rear mounted shocks did almost nothing. Hitting a large bump in the track was transferred straight up the steering column to the driver's arms. It wasn't long before I was thinking about ways to make the ride a little less aggressive. Not long after, my Drift-2 had an appointment with the angle grinder. It wasn't hard to see a way of converting the existing front assembly into a single swing-arm system. While this type of suspension is fairly low-tech' it's still very effective on a small vehicle like the Drift-2. Put simply, I wanted to retain as much of the original steering assembly as possible and not have to spent too much time or money. This mod cost about AUD$30. The only new parts/materials are a few bolts, some flat plate and some angle. Firstly, I cut up the original steering assembly (fig-2 dwg-A). Next I rejoined the 200mm long "bridge" section with the 280mm long base using two carefully shaped sections of 25mm angle. I also welded some C-section pieces to each end of the bridge to act as mounts for the shocks. C-sections were also welded to the two king-pin off cuts (fig-2 dwg-B). Drawing B also has a cryptic detail "drill and weld pivots (tube)". This is a 43mm long piece of 14mm outer-diameter (OD) tube that is welded into the base that will act as the pivot point for the swing arm. I drilled 2x 14mm holes through the base section and inserted the tube and welded it in place. Inside the tube I inserted a piece of nylon tube that is 12mm OD with a 1mm wall to act as a bushing. 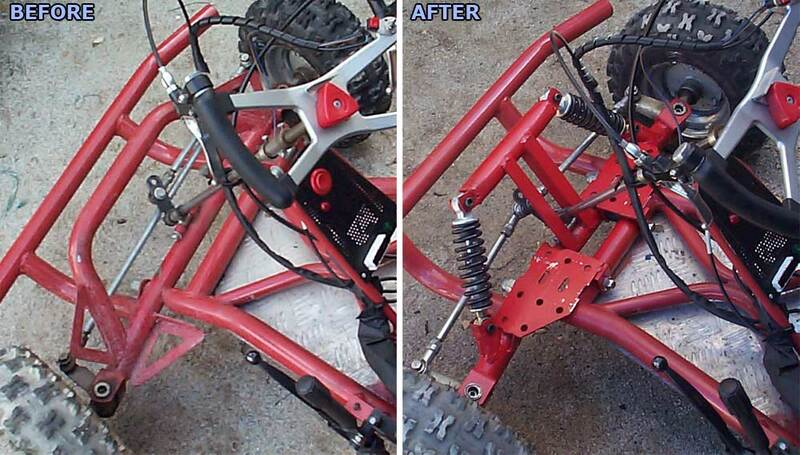 This process has to be repeated on the Go-Kart frame, its best to bolt the modified steering assembly back on to the frame so you can line up the holes. In the end, you should have 4 bushings. Finally I put together the swing arms. Each one is a flat rectangular plate (I recommend 4-6mm thick) that has some C-sections welded to the underside (fig2 dwg-C2). The king-pin off cuts are also welded to the underside of this plate. It helps to hammer the cut end of each offcut square/flattish to give more surface to weld to. Additional bracing can be added using scrap plate. 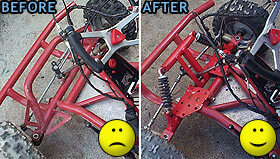 Drawing C1 shows a feature I added later after noticing a little bit of warping in the swing arm. Two short sections of angle were welded to the upper surface of the plate to increase rigidity these also provide some grip for my boot heels. You probably don't have to add these if you use 6mm plate? I used 3mm - too thin! The swing arms are attached to the frame with 140mm M10 bolts, these slide through the C-sections on the underside of the arms and through the bushings in the frame. I welded a short piece of strap to the front most C-section to prevent the bolts from rotating so that any wear is concentrated on the bushings not the C-sections. The finished result is quite ugly but it works well and was virtually free (some scrap steel and a few bolts). The photos were taken before some extra beefing up happened. I added angle to the top surface of the plate for improved rigidity and some extra bracing around the pivot points underneath. If I was going to improve on the swing arms I'd probably remake them from scratch with 30mm tube bent and pressed into a more purpose built shape. As usual I don't go into to many specifics, I think it's a good idea for anyone who attempts this to make improvements to my plans as they like. This guide is more a proof-of-concept that people should use for inspiration. Caution: Do this mod at your own risk, you could wreck your gokart (or worse yourself) if something breaks while you're tearing down the track. Other Guides. Back to Homepage.